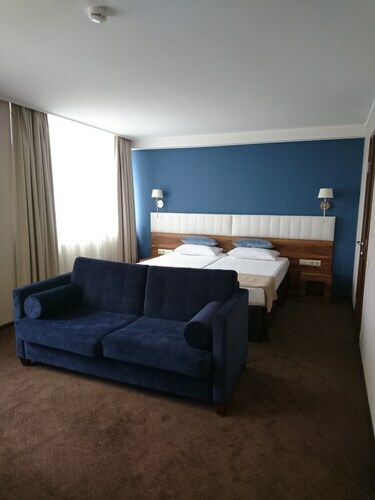 This family-friendly Kaliningrad hotel is located in the business district, within a 10-minute walk of The Fighting Bulls, Cathedral of Christ the Saviour, and Monument to Peter the Great. Kaliningrad Regional Drama Theatre and Blindage Museum are also within 15 minutes. Kaliningrad North Station is 8 minutes by foot. 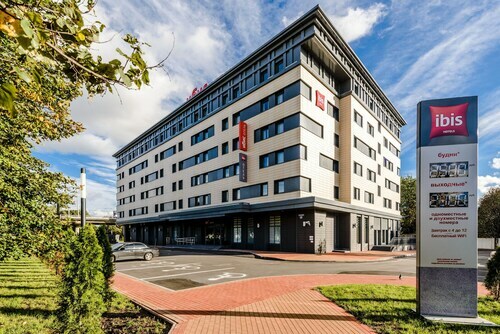 Situated in Kaliningrad, this hotel is within 2 mi (3 km) of Cosmonaut Monument, Kaliningrad Zoo, and Kaliningrad Central Park. Monument to Peter the Great and Schiller Statue are also within 2 mi (3 km). Kaliningrad North Station is 30 minutes by foot. Located in the heart of Kaliningrad, this spa hotel is within a 10-minute walk of Honey Bridge, Timber Bridge, and Immanuel Kant's Grave. Baltic Expo and Konigsberg Cathedral are also within 10 minutes. Kaliningrad South Station is 24 minutes by foot. 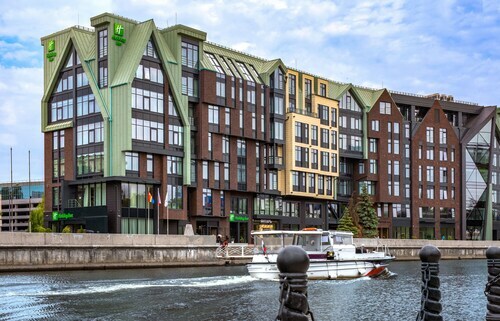 Situated in Kaliningrad, this hotel is steps from Estacada Bridge and Park of Sculpture. B-413 Submarine Museum and Museum of the World Ocean are also within 10 minutes. Kaliningrad North Station is 27 minutes by foot and Kaliningrad South Station is 27 minutes. 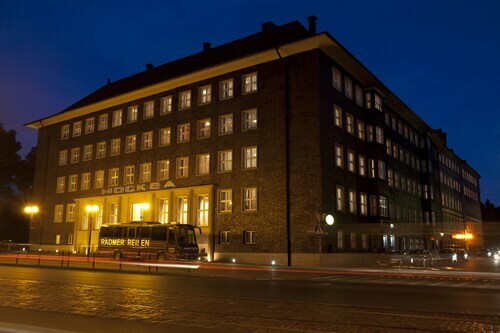 Located in the heart of Kaliningrad, this hotel is within a 10-minute walk of Cosmonaut Monument and Kaliningrad Zoo. Baltika Stadium and Kaliningrad Central Park are also within 15 minutes. Kaliningrad North Station is 17 minutes by foot. 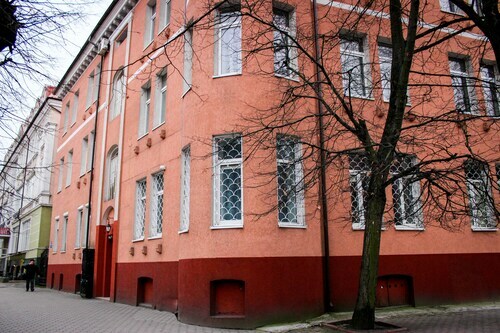 Situated in Kaliningrad, this hostel is within a 15-minute walk of Kaliningrad Central Park, Church of Queen Luisa, and Queen Louise Kirsch Puppet Theater. Cosmonaut Monument and Monument to Baron Munchausen are also within 15 minutes. Kaliningrad North Station is 23 minutes by foot. Located in the heart of Kaliningrad, this hotel is within a 10-minute walk of Estacada Bridge, Park of Sculpture, and Timber Bridge. B-413 Submarine Museum and Baltic Expo are also within 10 minutes. Kaliningrad North Station is 23 minutes by foot and Kaliningrad South Station is 23 minutes. 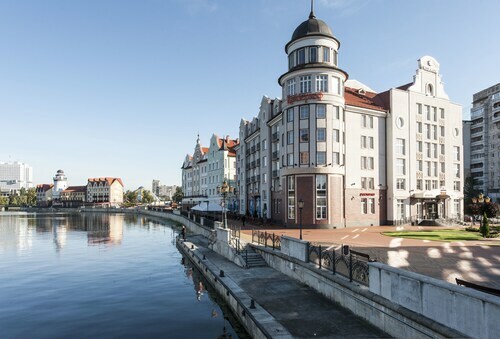 Situated in Kaliningrad, this hotel is within 1 mi (2 km) of Kaliningrad Regional Musical Theatre, Kaliningrad Central Park, and Queen Louise Kirsch Puppet Theater. Church of Queen Luisa and Monument to Baron Munchausen are also within 1 mi (2 km). Kaliningrad West Station is 23 minutes by foot. 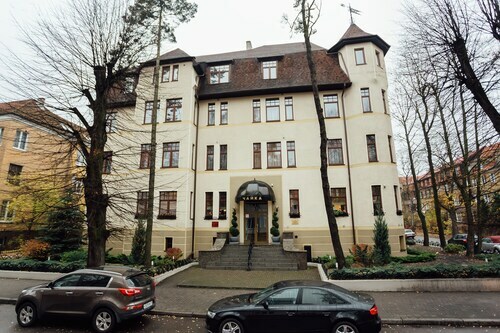 Located in the heart of Kaliningrad, this hotel is within a 10-minute walk of Kaliningrad Central Park, Queen Louise Kirsch Puppet Theater, and Church of Queen Luisa. Monument to Baron Munchausen and Cosmonaut Monument are also within 15 minutes. Kaliningrad West Station is 25 minutes by foot and Kaliningrad North Station is 27 minutes. Situated on a lake, this hotel is within a 15-minute walk of Immanuel Kant State University of Russia and Bismark Square. Rossgarten Gate and Tower of Donna are also within 1 mi (2 km). Kaliningrad Kutuzovo Station is 21 minutes by foot. Situated in Kaliningrad, this apartment building is within 1 mi (2 km) of Cosmonaut Monument, Kaliningrad Zoo, and Kaliningrad Central Park. Church of Queen Luisa and Queen Louise Kirsch Puppet Theater are also within 1 mi (2 km). Kaliningrad North Station is 23 minutes by foot. 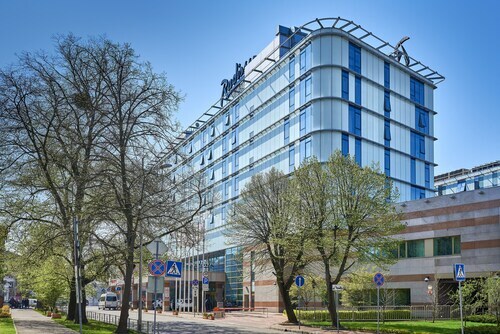 Situated in Kaliningrad, this hotel is within a 5-minute walk of Baltika Stadium and Cosmonaut Monument. Kaliningrad Regional Drama Theatre and Regional Tourism Information Center Kaliningrad are also within 10 minutes. Kaliningrad North Station is 12 minutes by foot. If you are on the hunt for something interesting to experience during your next vacation, a trip to Fifth Fort is a great idea. In order to explore it, you'll need to go to Kaliningrad, 680 miles (1,094 kilometer) from Moscow, the nation's capital. If you don’t want to spend a great deal of time in transit, reserve a room at the Fridrichshoff, just 2 miles (3 kilometers) away from Fifth Fort. Save your funds for your next great adventure when you spend a night at the KoikaGo, a low-priced hotel that's 5 miles (8 kilometers) away. A short commute away, you can find a handful of top-end hotels to spend a few nights. 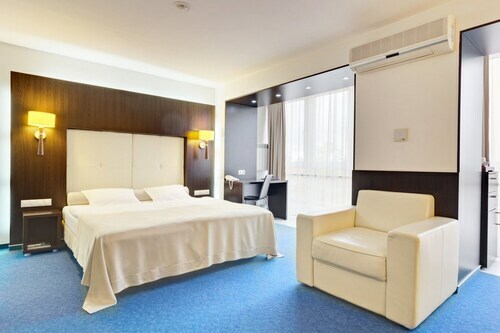 Rooms at the Radisson Hotel Kaliningrad and Marton Palace Kaliningrad are ideal choices. Food is also an essential part of traveling. You'll enjoy one of the more popular dining experiences at Navigator (Советский проспект, 285, Kaliningrad), just 0.6 miles (1.0 kilometer) away from Fifth Fort. Learning more about the history of a place at Great Patriotic War History Museum will surely help you to become more invested in the land and its citizens during your trip. A well-known local attraction, Monument to Karl Marx is a reminder of past events firmly planted in the souls of local residents. Add a creative element to your vacation by enjoying a play at Kaliningrad Regional Musical Theatre. Learn about some of the people and events that have helped shape this area at Monument to Pushkin, a significant local monument. There's no better place to take time out than Kaliningrad Central Park. Flip through your favorite magazine, kick a ball around with the kids or simply enjoy the tranquility in this leafy oasis. How Much is a Hotel Room in Fifth Fort? Hotels in Fifth Fort start at $18 per night. Prices and availability subject to change. Additional terms may apply.